It doesn’t get any better. That’s all you really need to know about this week’s Star Wars: Battlefront II mini-expansion. Timed to land alongside The Last Jedi’s theater release, it’s the first bit of post-launch content for Battlefront II and adds stuff that’s theoretically tied to the movie—meaning Finn and Captain Phasma as heroes, plus a new ground map set on the planet Crait (which given the loot crate controversy is a pretty ironic name) and new space battle map set around D’Qar. But most important in my view is the Star Wars: Battlefront II – Resurrection mini-campaign a.k.a. the actual ending of Battlefront II’s singleplayer story. If you haven’t played Battlefront II ($60 on Amazon) yet, all I’ll say is: The campaign ended last month on a major cliffhanger and DICE held back the actual “ending” until now. I’d hoped the proper ending could somewhat redeem Battlefront II’s thoroughly mediocre story, but it doesn’t. If anything, it gets worse. Let’s cut to the chase: There’s no reason Resurrection needed to be held back for The Last Jedi’s release. I want to put that up front because it was something I wondered about—did they hold it for spoilers? And the short answer is no, Resurrection has absolutely zero bearing on The Last Jedi’s story. This was purely a marketing move as far as I can tell. And that bothers me. It bothers me that if you bought this game in November, EA/Disney chopped off the ending of the campaign for no reason except advertising for one of the biggest film franchises in the world. Holding back multiplayer maps like the previous Battlefront? Sure, whatever. Story missions though? Completely inane. Regardless, Resurrection picks up right where we last left off, which is to say 30 years in the future. 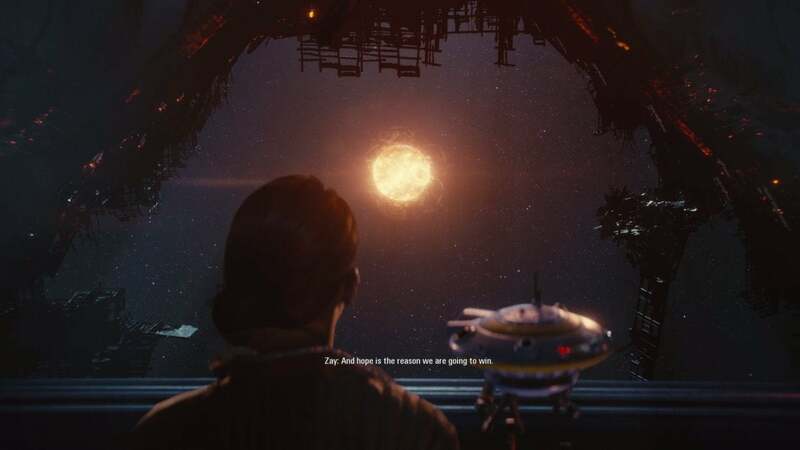 There’s a quick recap of the base game’s final mission, where Kylo Ren finds Iden’s husband Del. 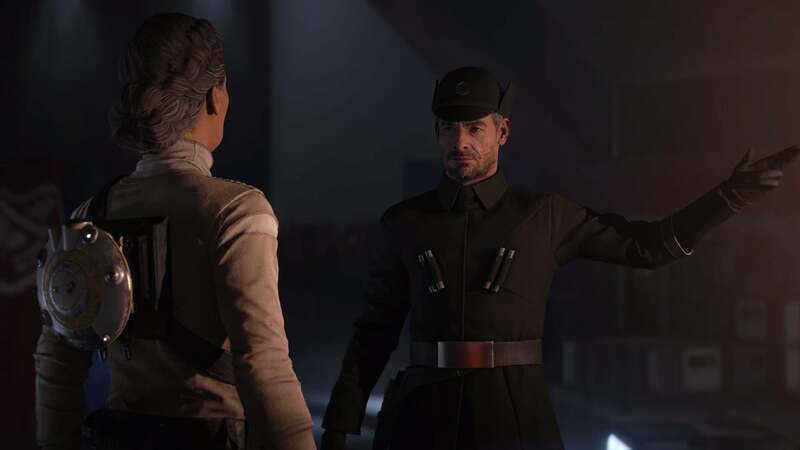 Del is of course then executed by he and Iden’s former Imperial squadmate Hask—the aforementioned cliffhanger ending. Back with Iden, her story thus becomes one of revenge. It’s an interesting setup, with much more believable stakes than the original story’s Forrest Gump-esque jaunt through the Rebel Alliance. There’s a built-in emotional hook, compounded by Iden fighting alongside her daughter Zay. It’s promising! And then it’s not. Pacing drags right out the gate, with an interminable space battle occupying the entirety of the first mission. The second mission takes us back to a planet we visited earlier in the campaign, which could’ve been interesting but instead feels like a slog through same-y combat arenas. The third is another Star Destroyer corridor-shooter. Roll credits. Seriously, it’s three (boring) missions and you’re out—all told, probably about an hour long. Maybe a bit more if you die, because the game’s checkpoints are still weirdly punishing. The length wouldn’t really bother me—after all, the expansion’s free—except that it mangles every emotional moment the game attempts. Hell, the first mission is only tenuously related to Iden and Hask’s story, which means we’re really dealing with two missions of story here. Star Wars: Battlefront II’s writing was hamfisted in the original campaign, but it comes off somehow even clumsier here. For instance, Iden tells Zay about Del’s death with a flat and unemotional “Honey, your dad is dead.” Zay barely even reacts. Hell, Iden barely reacts. We’re told she’s angry and upset, but it’s the kind of anger I’d feel if I went to the grocery store and forgot my wallet. Not like, “My husband of 30 years just died” anger. There are also some cringe-worthy references to current events (“Welcome to The Resistance”) plus plenty of schmaltzy lines like “Hope is the reason we are going to win.” Star Wars often doesn’t lend itself to tons of emotional depth—a side effect of its black-and-white, good-versus-evil universe. But even in that context, Battlefront II feels overwrought. If there’s anything good to say about Resurrection, it’s that at least it’s not plagued with two filler missions where we play as Finn and Rey or whatever. DICE mercifully spared us that indignity again. But given the fact this was held back a month, three pretty boring missions peppered with awkward cutscenes is worse than I expected. I’d hoped as I said that the story might at least go out with a bang, but it fizzles out just like the original story. And thus ends Star Wars: Battlefront II—I think. Resurrection ends on another pseudo-cliffhanger, so I guess DICE could surprise us six months from now with another three-missions-and-a-map-pack release or whatever. I honestly don’t know whether it’d be worth going back though. Battlefront II’s campaign, proper ending included, is anemic start to finish. Just so much wasted potential. 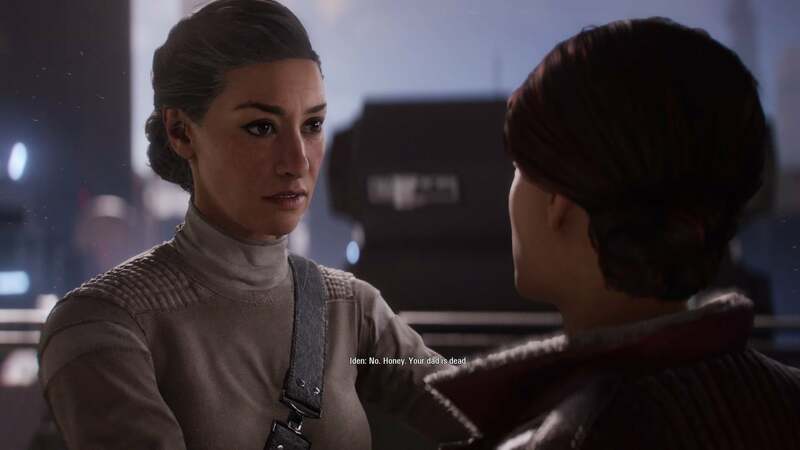 I don’t know whether blame lies with Disney or with EA and DICE, but the developers had an amazing character in Iden Versio and did nothing with her. The writing is middling, the setpieces are bland, and it just feels like you spin your space-tires for six hours or so. Plus, you know, the multiplayer is still busted, which we covered extensively in PCWorld's original Star Wars: Battlefront II review. But I guess I should write a bit about that side of the equation before checking out. To keep it short: The new Crait map is very pretty, but after opening a half-dozen loot crates and getting garbage out of all of them I’m just not interested in playing any more of it. 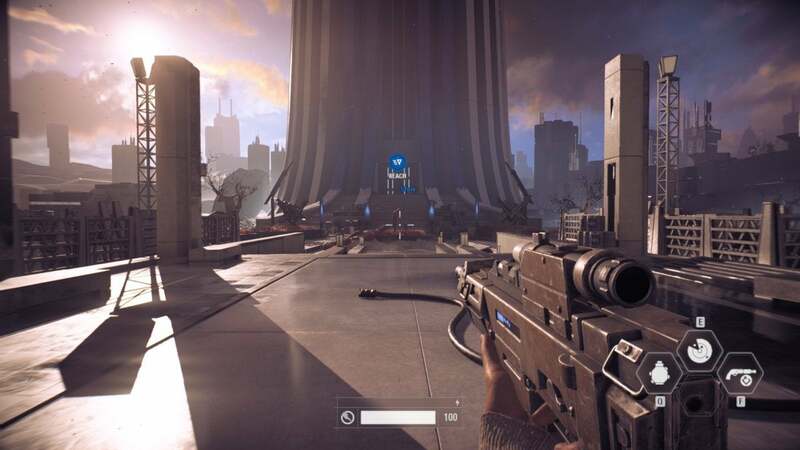 This is an old and tired refrain by now, but DICE has nailed the look and feel of Star Wars once again. The actual progression system hasn’t improved much since launch though, and I don’t expect it to ever be truly fixed. They’ve upped the amount of credits you get per match, but that’s a bandage over an infected wound at best. I don’t plan to keep playing. It’s disappointing. All of it, the whole ignominious saga of Star Wars: Battlefront II. It's more disappointing maybe because I thought they’d nailed it this time—coming out of E3, I felt a small glimmer of hope. They’d done a story! They’d done space battles! They’d added in all three eras from the films! They’d made, in other words, a complete game this time around. This might very well be my final verdict on Battlefront II though, barring some miracle next year, and none of it’s lived up to my expectations. 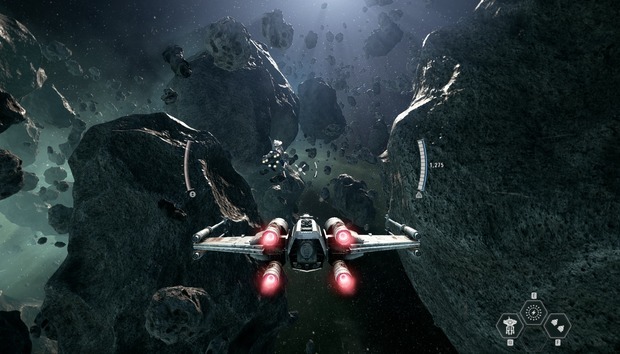 Actually, scratch that—the space battles are great. But the rest has all been lackluster, plagued by poor decisions and controversy and ugly systems designed to peddle loot boxes every step of the way.